I’ve never sold anything on or through Kindnessgirl, I have protected the site pretty fiercely over the years simply because I always wanted the heart and intent of this life and work to be crystal clear. I’m not a non-profit, I fund all my own kindness projects (although kind friends have put a $10 bill in my hand occasionally, left supplies on my doorstep or stamps for mailing when they know I took on too much) and I work 2-3 part time jobs (outside of my kindness work) to contribute to my family’s needs to live and thrive. And I can’t tell you how, but somehow I have all I need and nothing more, which I love. Part of me knows on some level, this is not sustainable (4 kids, 3 jobs, speaking gigs, community projects and kindness work) but I don’t exactly know what the next step will look like for me or how money even fits into all of this. So I was a wee bit nervous about attaching money to this sticker project but Suzanne was the perfect partner to take this leap with. We both wanted her art and the message of kindness out into the world, and with just a little start up cash, we knew we could at least put it out to see if our intuition was on and the universe felt the same…and it felt appropriate that if that were so (via profits), that the kindness travel even further…to more art, more kindness. 1. You guys LOVE stickers and kindness…we actually sold out before noon the first day but put a rush on another print order that same day! We were so engrossed in putting the packaging together, I accidentally worked us right through lunch…never even realized- it was all just so pretty and my kindness ADHD brain was going a mile a minute. 2. We figured out how to be kind and NOT be vandals- We didn’t plan this but the stickers are scored on the back in 3 lines so you can peel just one off, and leave the sticker sticky on something. Then it can be taken or peeled off easily when someone finds it. 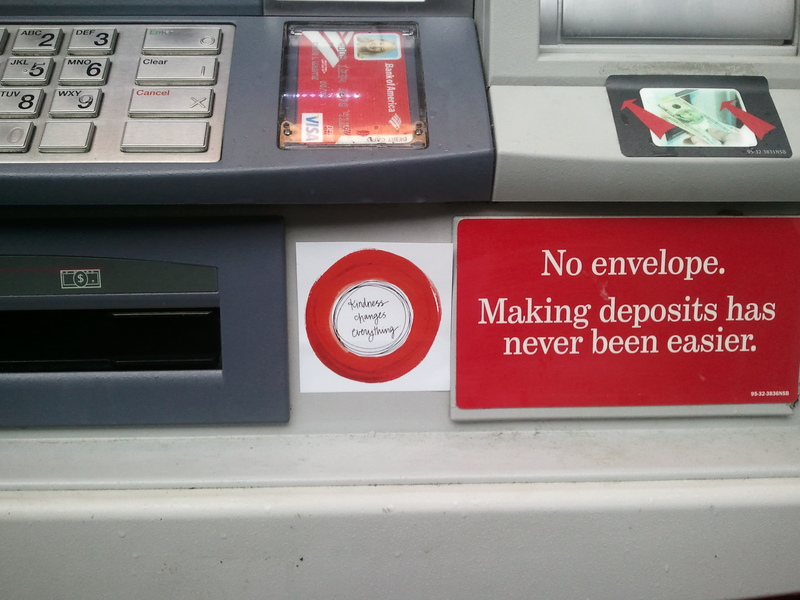 Doesn’t seem like it just fits here at the ATM?! 3. We overestimated how much shipping would cost- we were delighted to discover that the shipping was indeed much cheaper than anticipated so we will be contacting those of you with bigger orders to make that right. So sorry for the learning curve (we adjusted it since). As for the smaller orders- it may not be time or cost effective to return $1 so in honor of you fellow soulsisters, we will be Ding Dong Ditching flowers to 3-4 women we know that may need a little love and kindness this week with the shipping overflow of funds. 4. SOOooooo we are still deciding what to do with the Soulsister Jar Fund of Kindness but we will let you know ASAP when we do, and it may just involve some kindness back to you all. (all funds will go back into kindness projects, no personal profits will be taken) We are just so excited so many of you decided to join us in this project! Not sure of the total number in the fund but will report soon! Thank you…your notes, your names, putting together your packages, each part made it so fun for us. 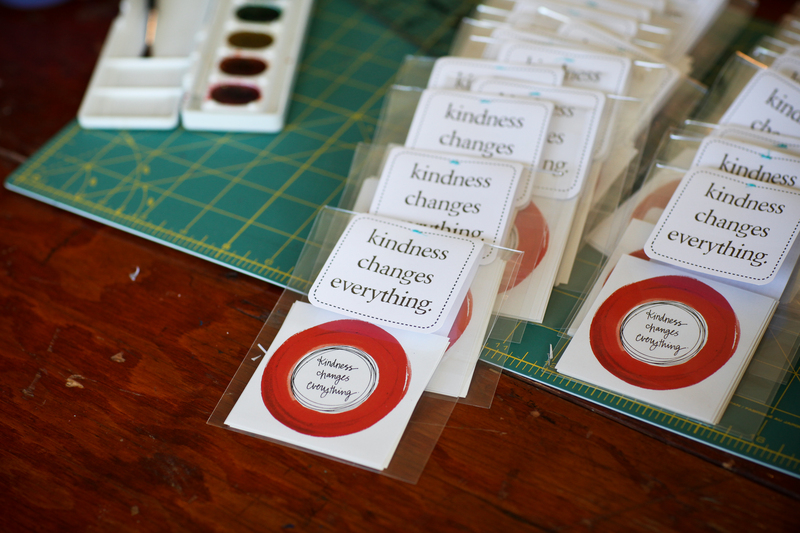 And if you really, really wanted some but just didn’t have the funds right now- I reserved 3 sets for 3 special folks, please e-mail me at patience@kindnessgirl.com and I will send some your way. I got mine in the mail the other day and I just held them like little precious sheets of joy in my hand! I feel like I want them to go out with a kindness mission I have yet to imagine but I’m having faith that the idea will come to me. Thank you so much for these- I have a feeling they will reach people and places we’ve never even imagined. SO excited to see where they end up B! Thank you for being part of this with us! 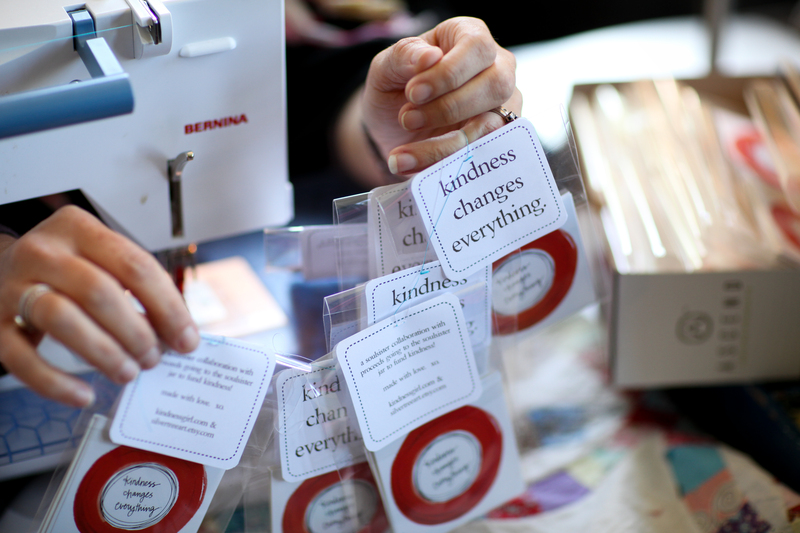 I received my Kindess stickers this past weekend. I’m not sure if I was more excited about getting the stickers or just getting an envelope from Patience. You are such a special person. I will definitely send pictures of where I’m sticking my stickers and I’m working on who I want to give my extra 5 stickers to. Now I wish I had ordered more! So I’ll definitely buy your next project. Keep it up Patience! You are inspiring so MANY people! Patience, I love all your words. But these are the weight I’m carrying. . . I have somehow built my passion into a place that holds the space of a career without the pay stub. (delightforthesoul.com) It feeds me. It uplifts many. It’s a place of complete alignment, except for ‘supporting the family’. And I need to take a hard look at it. Please keep sharing this part of you. It’s an important piece of life’s puzzle for all of us. I received my stickers last week and immediately sent half of them to a friend of mine in Seattle. We are both thrilled to be a part of your mission to make the world a kinder, gentler place to be. Thank you for all the good work that you do, and that you inspire us to do! Love the stickers – how about magnetic bumper stickers for our cars next? I’ve never had a bumper sticker on my car but, this one, I would display proudly.